The Battle of the Little Bighorn (or “Custer’s Last Stand”) was between the combined forces of the Lakota, Northern Cheyenne, and Arapaho tribes against the 7th Cavalry Regiment of the United States Army. 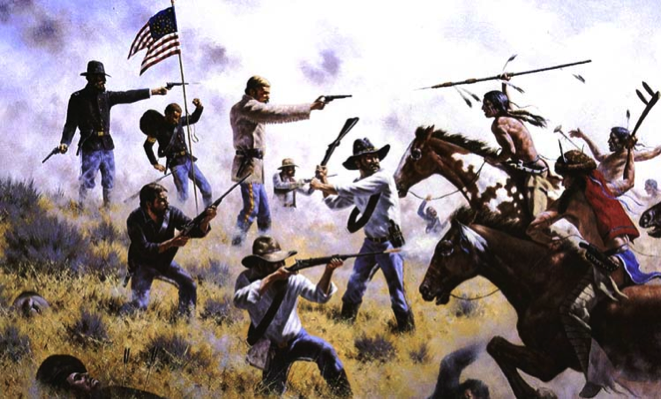 The battle occurred on June 25–26, 1876 near the Little Bighorn River in eastern Montana Territory. It was an overwhelming victory for the Lakota, Northern Cheyenne, and Arapaho. The U.S. Seventh Cavalry (including the Custer Battalion) suffered a severe defeat, with five of the Seventh Cavalry’s companies being annihilated – including General Custer himself. Scott Simpson (U.S. Diplomat & Management Officer for the U.S. Consulate in Sydney), will explore the themes and reasons why the Battle of Little Bighorn occurred and its historical impact on the United States.